M&M's are "colourful button-shaped candies" produced by Mars, Incorporated. The candy shells, each of which has the letter "m" printed in lower case on one side, surround a variety of fillings, including milk chocolate, dark chocolate, crisped rice, mint chocolate, peanuts, almonds, orange chocolate, coconut, pretzel, wild cherry, cinnamon, raspberry, and peanut butter. 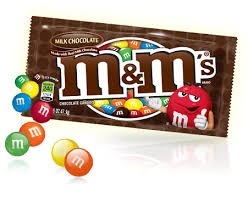 M&M's originated in the United States in 1941, and are now sold in as many as 100 countries. They are produced in different colours, some of which have changed over the years.